This material exhibits very high thermal conductivity. In addition, this material exhibits high compressibility and natural adhesiveness. It is excellent for applications where electrical insulation and thermal conductivity is needed. The exceptional ability of this material to conduct heat away from sensitive components makes it applicable for use in very heat sensitive applications. 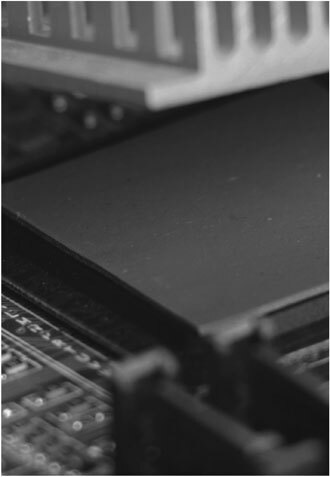 The 6004 is an excellent high-level thermal conductive interface material. Weight Loss <1 % @204oC/24 hr. The 6004 material provides low thermal impedance; with increasing pressure, thermal impedance becomes lower. 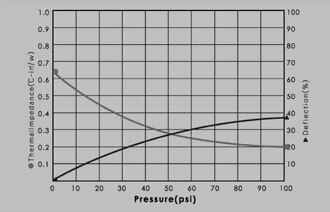 The 6004 material, exhibits high deflection (softness); as pressure increases the deflection percentage increases. This material provides good compliance to mating surfaces. Have a question or need a quote? Feel free to fill out the form below or give us a call at 1-877-MAJR-PRO (625-7776).